The EM200 features a serial port (RX, TX lines), plus nine general-purpose I/O lines (GPIO0-8). All of the above lines are of CMOS type. Maximum load current for each I/O line is 10mA. The serial port of the EM200 can work in one of the three modes: UART, Wiegand, or clock/data. All three modes are described in detail in the documentation for the serial (ser.) object found inside the "TIDE and Tibbo BASIC Manual". Additionally, see the Platform-dependent Programming Information" section inside the EM200 platform documentation (same manual). Simplified structure of EM200's I/O lines is shown on the circuit diagram below. All lines are "quasi-bidirectional" and can be viewed as open collector outputs with weak pull-up resistor. There is no explicit direction control. 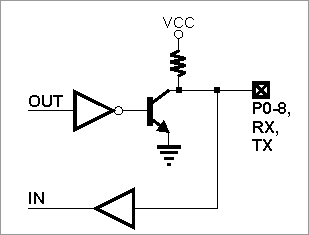 To "measure" an external signal applied to a pin the OUT line must first be set to HIGH. It is OK to drive the pin LOW externally when the pin outputs HIGH internally.